Ajo Elementary School services kindergarten through eighth grade on the district campus. Ajo Elementary’s kindergarten through third grade classrooms are in an area separate from the rest of the campus, and the fourth through eighth graders share the main campus with the high school, utilizing the northern wing of the campus. Ajo Elementary also provides a space on campus for preschool classes in cooperation with Head Start. Ajo Elementary School follows a balanced literacy approach to instruction through the framework of the Four Blocks program. 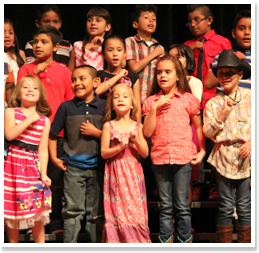 The Four Blocks program prepares Ajo Elementary students for success by embedding reading and writing instruction within all curricular areas. Supported by pull-out reading intervention and Accelerated Reader, the Four Blocks program provides Ajo Elementary students with multiple opportunities to improve their literacy skills and language acquisition. The Houghton-Mifflin Language Arts text series provides additional instructional support to meet the needs of all readers, including students with limited English proficiency. Ongoing student engagement and curriculum mapping. Visit our Curriculum page to learn more about Ajo’s academic standards and assessments. Visit these pages for more information about what we have to offer and how we measure up.